February 7 Force India. Testing at Jerez. Any news on who has got the second seat at Williams? There were rumours going around about Bruno Senna, but I think they haven't been vindicated by any of the quality papers. I'm surprised Sutil doesn't have a team for next year, finished last season on a high, and was pretty consistent. I read on the eurosport website that Senna "downplays Williams rumour" or something. Mercedes AMG don't debut their new car until the 21st of February at the earliest. They've already said it won't be at the first test. Hispania's new car launch will be delayed as well. Valterri Bottas, the team's test driver in 2011 and 2010 has signed for the team, but it is as yet unclear whether he is again a tester, or in the second car. Tester: Unknown. Robert Wickens had the role last year, and may continue in that role. As for other changes for 2012, the Turkish GP has been dropped. Virgin/Marussia have parted company with Nick Wirth, and have a technical partnership with McLaren, similar to the one Force India have, and the one HRT have with Williams. The USA GP returns at the Circuit of the Americas in Austin, Texas. However, there have been issues surrounding the funding, and it could yet collapse like Donington hosting the British GP did a few years ago. Similarly, Valencia are looking to pull out after being unable to sustain the costs, so that may be gone post 2012 as well. There are rumours that Spa Francorchamps and Circuit Paul Ricard in France (and host of the French GP in the late 80s) will alternate. Teams cannot run exhausts through the floor for extra downforce like they did in 2011. They are required to run top facing exhausts from now on. The maximum time for any session is 4 hours. So if we get a situation like in Canada last year, the clock will run and the result declared after 4 hours. In the event of a Safety Car period, lapped cars will be allowed to overtake the SC so that the field is in order when the SC pulls in, to avoid blocking on a restart. Stephen Mitchell wrote: Any news on who has got the second seat at Williams? There were rumours going around about Bruno Senna, but I think they haven't been vindicated by any of the quality papers. I'm surprised Sutil doesn't have a team for next year, finished last season on a high, and was pretty consistent. Adrian Sutil is apparently being looked at by Williams, but his situation is a bit difficult. On the Chinese GP weekend he got into an altercation with Eric Lux, CEO of Genii, who own the Lotus F1 team. Lux suffered cuts to his neck from a broken glass, and is filing charges against Sutil. If found guilty, Adrian could be off to prison, so it's a risk taking him on at the moment. Jeez! Had no idea about that. Jesus, what was the altercation rumoured to be about? On the car design front, Ferrari and Mercedes AMG have hinted at building more aggressive cars than last year. What does more aggressive even mean? They will need to improve considerably (and possibly take a few more risks with the design) to get anywhere near the Red Bulls. Chris Chan wrote: Jesus, what was the altercation rumoured to be about? Chris Chan wrote: What does more aggressive even mean? Basically taking more risks with their design. There's a balance between building a fast car and one that doesn't break all the time. Adrian Newey likes to go as far as possible, sacrificing reliability for speed, and working backwards to build reliability. Any ideas what is going on with Kubica? Richard Wallace wrote: Any ideas what is going on with Kubica? Eric Bouiller said that they hope he recovers but they aren't going to hold his seat for him. Kubica himself hasn't said anything at all, but Ferrari have been heavily linked with a test and the possibility of replacing Felipe Massa for 2013. When Alex Nannini severed his arm in 1990, even though it was reattached he never recovered full use of it and as such couldn't drive an F1 car again because he didn't have the reflexes for it anymore. Kubica also severed nerves in his hand, so will have diminished reflexes when he returns (as is the norm for injuries of that nature). It remains to be seen just how much that impairs his ability to drive. His contract either ran out at the end of 2011, or runs out at the end of this year, so it's highly likely Renault will dump him anyway. I, for one, really hope he recovers back to his best. I thought he was a top driver and could be challenging with the best in the right car. A Kubica-Alonso in 2013 would be very interesting indeed, but I guess, as you said, it all depends on his recovery and how much he has been affected by the injury and whether he will fully recover. I have a feeling next year will be very open and we might see 4/5 drivers battling out for the title with some of the rule changes for next year. Either that or Adrian Newey produces another car that stands head and shoulders above the rest and we'll have a three time world champion in Vettel! Rory Byrne is back to help out Ferrari with their 2012 car though, and he has designed the second and third most successful F1 cars ever. Alonso destroyed the field in the second half of 2010, so if he is given a car on the pace from the beginning of the year, I feel he will run and hide. 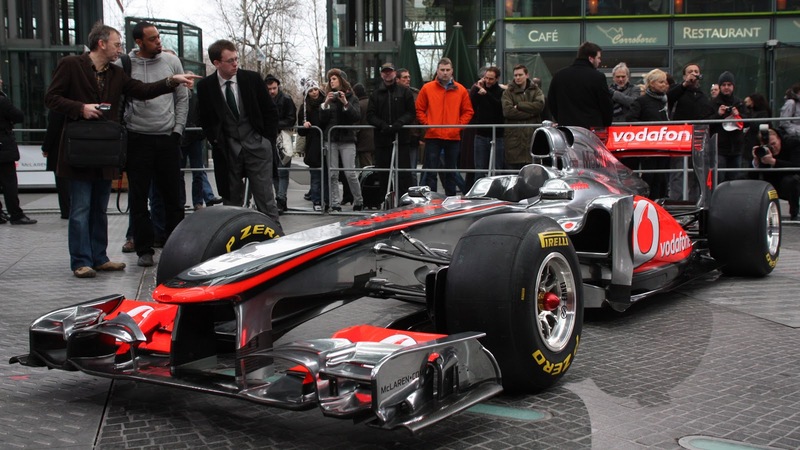 McLaren launch is on February 1st, at the MTC in Woking. Interestingly, also, BBC now reporting that Senna is likely to get the 2nd seat at Williams. Intriguing, particularly from a historical perspective, seeing the Senna name attached to a Williams car again. 2) Failing a crash test would seem to suggest Ferrari are pushing the absolute limits of the speed/safety ratio. Stephen Mitchell wrote: Interestingly, also, BBC now reporting that Senna is likely to get the 2nd seat at Williams. Seeing Senna drive a Renault in the old Lotus JPS livery was surreal enough for me! Sad to see Kubica wasted his talent. He will be very lucky to step in any F1 car again. Mind you, with Kimi Raikkonen back in a Lotus, I suppose anything is possible.